Amendment to the Rule 170(i) of General Financial Rules, 2017 – Reg. : Departement of Expendiure OM. Dated 25th July 2017 ** No.F.20/2/2014-PPD(Pt. ), Government of India, Ministry of Finance, Department of Expenditure, Procurement Policy Division ** 516, Lok Nayak Bhawan, New Delhi the 25th July, 2017 ** OFFICE MEMORANDUM ** Subject: Amendment to the Rule 170(i) of General Financial Rule (GFR), 2017. New Delhi the 25th July, 2017. Subject: Amendment to the Rule 170(i) of General Financial Rules (GFR), 2017. 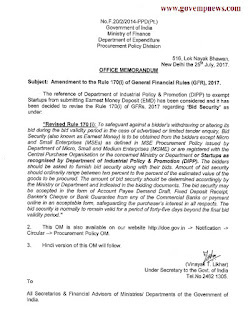 The reference of Department of Industrial Policy & Promotion (DIPP) to exempt to Startups from submitting Earnest Money Deposit (EMD) has been considered and it has been decided to revise the Rule 170(i) of GFRs, 2017 regarding ‘Bid Security’ as under. 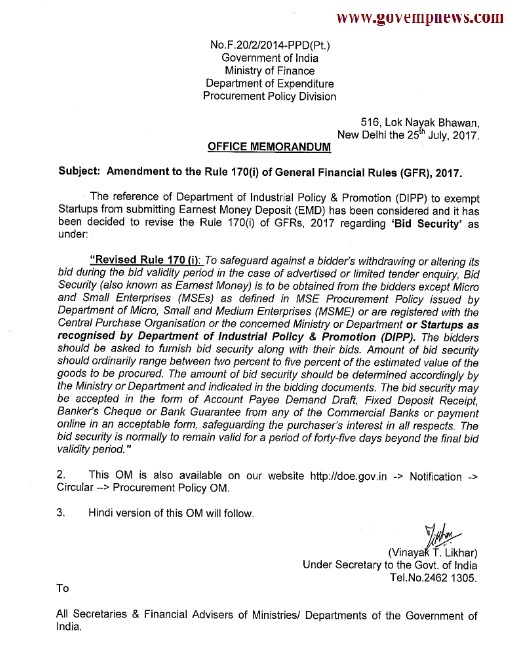 “Revised Rule 170 (i) : To safeguard against a bidder’s Withdrawing or altering its bid during the bid validity period in the case of advertised or limited tender enquiry, Bid Security (also known as Earnest Money) is to be obtained from the bidders except Micro and Small Enterprises (MSEs) as defined in MSE Procurement Policy issued by Department of Micro, Small and Medium Enterprises (MSME) or are registered with the Central Purchase Organisation or the concerned Ministry or Department or Startups as recognised by Department of Industrial Policy & Promotion (DIPP) . The bidders should be asked to furnish bid security along with their bids. Amount of bid security should ordinarily range between two percent to five percent of the estimated value of the goods to be procured. The amount of bid security should be determined accordingly by the Ministry or Department and indicated in the bidding documents. The bid security may be accepted in the form of Account Payee Demand Draft, Fixed Deposit Receipt, Banker’s Cheque or Bank Guarantee from any of the Commercial Banks “or payment online in an acceptable form, safeguarding the purchaser’s interest in all respects. The bid security is normally to remain valid for a period of forty-five days beyond the final bid validity period." 2. 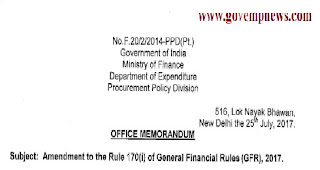 This OM is also available on our website http://doe.gov.in -> Notification -> Circular --> Procurement Policy OM. 3. Hindi version of this OM will follow. All Secretaries & Financial Advisers of Ministries/ Departments of the Government of India.